Despite its apparent shortcomings, Qualcomm’s Snapdragon 810 is far from being dead. The company does have serious clout in the industry after all, and more and more manufacturers seem to be adopting its high end silicon for their devices. Apparently, the Snapdragon 810 will also be making an appearance on Microsoft’s soon to be expected Lumia 940 XL, which should also see its launch feature Windows 10 for Mobile. Looks like Microsoft’s eager to make its Lumia range successful on all accounts and equipping the Lumia 940 XL with the Snapdragon 810 is one way of the company ensuring that its device won’t be behind others when it comes to processing power. The Lumia 940 XL has leaked in its entirety on GFXBench today, and we get to know what to expect from Microsoft’s device in its entirety today. 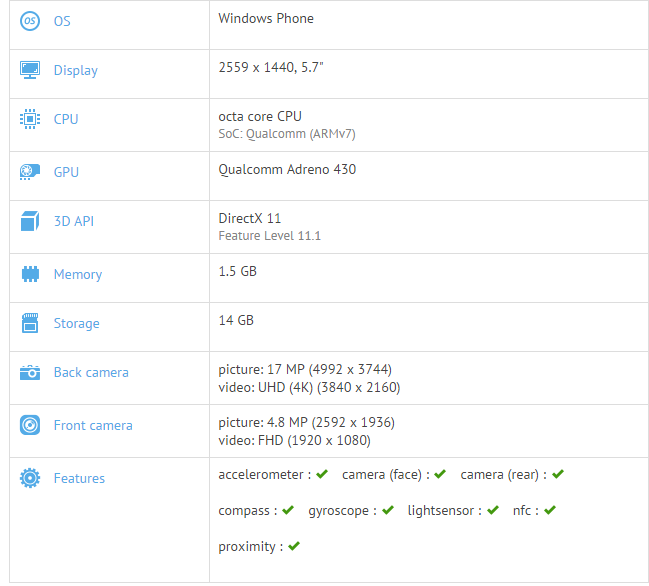 According to GFXBench, the Lumia 940 XL will be coming with a 5.7 inch screen, coupled with a screen resolution of 2559 x 1440. This will be paired with 1.5 GB RAM to complement the octa core Snapdragon 810 CPU on board. Internal storage for the device will be 14 GB, which seems a little too less if you ask us. Rear camera specifications for the device are impressive, with the 940 XL listed with a 17 MP rear camera and a 5 MP front camera. It’ll also be supporting 4K video recording, courtesy of the Snapdragon 810 on board. The Lumia 940 XL is also listed with the Adreno 430, which makes us believe that the device will indeed be coming with Qualcomm’s infamous chipset. Lets see if Microsoft can succeed where others have failed and stop the Snapdragon 810 from overheating. We’ll keep you updated as this develops. Stay tuned and let us know what you think in the comments section below. It shouldn’t be long before we should see Windows 10 for Mobile reach its final stages.